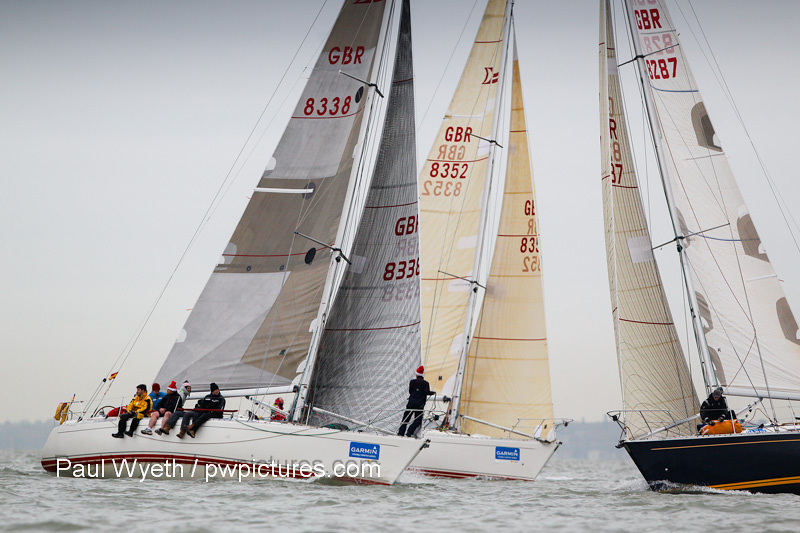 Please find below the final race report from the 2013 Garmin Hamble Winter Series and some great pics by Paul Wyeth/pwpictures.com. 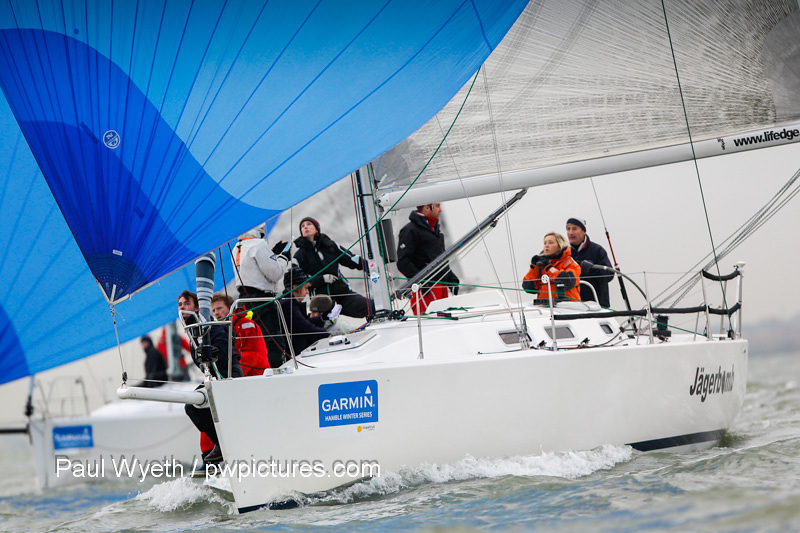 A cold, crisp day ushered in the final race of the 2013 Garmin Hamble Winter Series. Ashore, leaves and flags hung motionless, but out at the race course competitors were greeted by a good 10 knots of breeze from the NW - perfect conditions for a winter’s sail to round off a successful series, which, in contrast with many events saw an increase in entries this year – no mean feat in a challenging climate. "It is great to see the hard work of so many at Hamble River Sailing Club rewarded with growing entry numbers for the main Winter Series, which bucks the general trend’ commented commodore, Trevor Pountain. 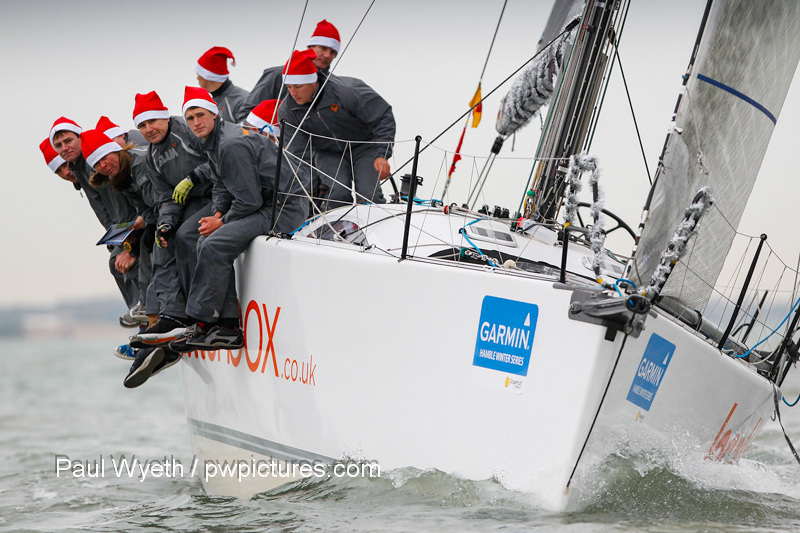 ‘This year is the 32nd outing for the Hamble Winter Series, and we have been privileged to have Garmin as its title sponsor since 2005. We are very proud of our reputation for providing the best winter racing in the UK. Our customers consistently compliment us on our mix of challenging Solent courses - as well as a great welcome ashore and the cheapest pint of 6X in Hamble!" On the water, while first place was secured in some classes there was endless scope for changing positions in the rest of the fleet, with some single-point differences ahead of this race, guaranteeing some close racing. Localletterbox Zero II had sewn up the series in IRC 0 and won the class by 10 points overall – but they didn’t have it all their own way as Ed Broadway’s Hooligan VII won the final race by two minutes. In IRC 1, the day’s racing reflected the overall results, with Allie Smith’s Puma Logic finishing 1st, ahead of Paul Jones’ Passion and Philip Farrands’ Old Mother Gun in second and third respectively on the water and overall. Huw Philips’ Malice turned things on their head in IRC 2, topping the class ahead of overall winner, Mike Bridges’ Elaine, Robbie and Lis Robinson’s third-placed overall Hot Rats and Paul Heys on Jungle Drum, who finished fourth on the water but took second overall by two points. In IRC 3, Nick Munday’s IndulJence won the final race to take the series by 7 points. David Greenhalgh’s J’Ronimo took second on the water and overall, ahead of Chudziak, Horner and Malas on Wee Bear, whose fourth place on Sunday was enough to hand them third overall by one point. Philip McDanell’s Impala 28 Trudi sailed a blinding race to win the day prize in IRC 4, which placed them third overall behind the class winners, Toby Gorman’s Stan the Boat, and second-placed Erik the Red. In the Sigma 38s, Nigel Goodhew’s Persephone had already secured the win ahead of this week’s race, but there was an incredibly close battle for 2nd place between Kevin Sussmilch’s Mefisto and Chris and Vanessa Choules on With Alacrity, who went into the last race tied on points. After a close race, Mefisto beat With Alacrity over the line by just over a minute to take 2nd by one point. David McLeman’s Offbeat won the final race in the J/109 class, which placed them fourth overall. David McGough’s Just So won overall, five points clear of Paul Griffiths’ Jagerbomb, which finished on equal points with Owain Franks’ Jynnan Tonnyx but edged ahead on countback. Cornel Riklin’s Jitterbug beat David and Kirsty Apthorp’s J-Dream to win the final race of the series, but J-Dream topped the four-boat class to win the series. Champagne prizes were presented by the Sigma 38 class, who sponsored the race day to celebrate their long support of the series, with extra prizes provided by the Bugle. Thanks to all competitors, sponsors, race teams and volunteers for helping to make this year’s Garmin Hamble Winter Series a success, despite the occasional best efforts of the weather. Next Saturday is the prizegiving and end of series party at HRSC at 1830. All crews are welcome. We’ll see you on the water next year, when the series runs from 5th October to 30 November.